Heard of BYOD? Get Ready for BYOC! Bring Your Own Device to work or BYOD is a concept that was first seen in businesses in 2009 when Intel saw its own employees bringing their personal devices to work and using them for business purposes. But it wasn’t until 2011 that it gained popularity among businesses when IT service providers started recognizing the BYOD movement. Venture Beat describes the BYOD phenomenon as the new consumer enterprise, where employees are no longer just working within their offices and consumers are no longer limited within their environments. It is a movement towards the blending of business and personal technology in the workplace, based on the mentality that people should use whatever works best to get the job done, says Tech Pro Research. BYOD allows employees to bring their own personal phone or computer to work and it is also the concept behind the more recent revolution of bringing your own time tracking clock to work (BYOC) for hourly employees. BYOC (Bring Your Own Clock), inspired by the concept of BYOD, has made it possible for employers and employees to track work time from literally anywhere as long as they have their own device and time clock software in place. 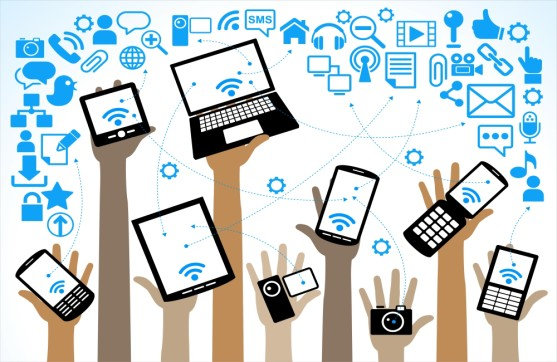 How Many Companies are Implementing BYOD? From BYOD’s beginnings in 2009, Tech Pro Research reveals that 72% of organizations they surveyed are already allowing it or planning to implement it in their workplace. A separate study conducted by Forrester also reveals that more than half of North American and European countries are in the process of developing and putting BYOD programs in place in response to the demands of their employees. Back in 2013, Gartner boldly predicted that more than half of employers would require employees to provide and use their own device for work. In the last 5 years, BYOD has successfully penetrated white collar jobs. Traditionally, the BYOD trend has caught hold primarily among white collar employees. Using their devices for checking email, taking calls, communication tools, number crunching via spreadsheets and more, the power of BYOD has been clearly demonstrated for this type of work. However, with the proliferation of affordable smartphones, it is now catching on with organizations that employ blue collar workers as well. Even though email, word processing, and spreadsheets aren’t part of most blue collar workers job descriptions, there are plenty of ways using an employee’s own smartphone or tablet can benefit both you, the employer, and the employee. An example of this is with Uber drivers, who are required to use their own devices at work. Time tracking via an employee’s own device is another great example of how BYOD is catching on with blue collar workers. It makes sense to start implementing BYOD with BYOC (Bring Your Own Clock), which basically allows your employees to clock in their work hours from just about anywhere using their own smartphones or tablets. 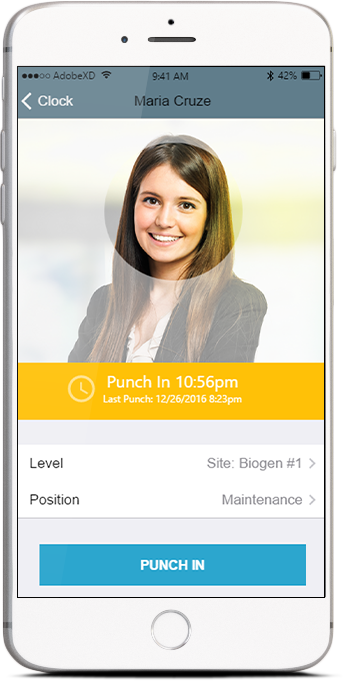 You can even get the power of a biometric time clock or facial recognition time clock on the mobile device. This increases the accuracy and honesty when tracking time and gives you peace of mind knowing time fraud isn’t an option when it comes to BYOD. With just a software install from the app store, your employees can turn their own phone into a mobile facial recognition time clock, capable not only of biometrically identifying them via facial recognition, but also locating them using GPS and even more precise, indoor positioning via microlocations. All of this capability exists from their existing device. By using a facial recognition system on their device, buddy punching and other forms of payroll fraud are no longer a concern. Think of drivers, commercial cleaners, construction workers, or technicians who spend most of their work hours in the field or at a client’s facility. With BYOC, you are making it possible for your employees to track their work hours easily and accurately using their personal devices. You no longer needs to purchase expensive proprietary hardware clocks. You also don’t need to budget for hardware maintenance. Millennials (25-34 years old) are expected to have their own smartphones, too. In fact, they are the top smartphone users with 97% ownership followed closely by Gen X (35-44 years old) at 96%, according to the latest Nielsen report. Training to use specialized clock hardware won’t be necessary anymore. Using biometric face recognition for time and attendance for example, is just as easy as taking a selfie. By allowing your employees the use of their own device at work, you are allowing your employees the use of a tool they are already empowered to use. This will make them more effective at their jobs. As already mentioned, the concept of BYOC, especially software that utilizes biometric face recognition, rids your organization of employee payroll fraud and time theft. You will no longer lose money to ghost employees or to buddy punching. However, you won’t have to trade-off convenience to achieve this level of certainty with time collection. Your employees already know how to use their own devices. You no longer need to collect timecards or check the inputs one by one. Advanced time and attendance programs that use facial recognition, automate many payroll processes such as computing work hours or tracking employee location while working. So, if you want to empower your blue collar workforce and gain a competitive advantage through innovation, it is best to embrace the BYOC movement. Turn the supercomputer all of your employees have in their pocket into a tool that helps you both succeed and let them “Bring Your Own Clock” to work.